It's simple enough. Isn't it? Type in Google.com in browser address bar and sign in with your preferred Google account providing your email and password. So you can go to Gmail to check for new emails, Google+ for new notifications, view Google account activity report and so. But what if you need to sign in to another Google account of yours? 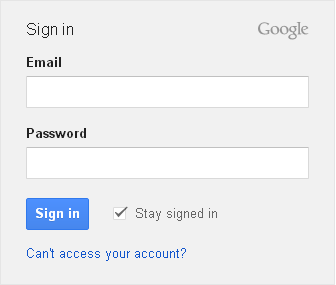 Sign out from signed in Google account and type in new user credentials to sign in with your other Google account. Are you a person who doing it everyday? If you keep doing it everyday, that's not much convienient. Don't you think? Even if you don't think so, Google think it is. Google has found that sometimes people go for multiple Google accounts without sticking with only one. So Google introduced a way for users with multiple Google accounts to sign in and switch between their accounts in a second. Viewing four different Gmail accounts of yours in four browser tabs at once without spending time to log in and log out. How convienient it is? Now you are eligible for that and stop the sign-in cycle from today and save more precious time for you. Google let you sign-in with your Google accounts and switch between them. Sounds very simple and yeah, very easy to sign in too. However there are few things I need to remind before you sign in with multiple accounts. ● The first Google account you select to sign in is considered as the default Google account. 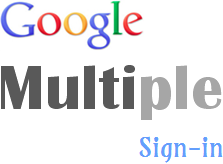 ● Currently, not all products or services of Google supports the multiple sign in. Here's a list of popular Google products support multiple sign in right now. ● If you access a product or service that not support multiple sign in after you signed in with multiple accounts, then your default Google account will be used to sign in for that product or service there. So remember to use your primary account or the account you use mostly as the default account. ● Currently you can sign in to maximum of 10 Google accounts. That's it. Are you ready to experience multiple sign in? Let's go for it. 1. First off, go to Google Sign In page and sign in with your default Google account. Note: You can tick off Stay signed in option, if you are sign in for your Google accounts temporarily. For example, if you sign in via a public computer or computer of your friend. Then after you close your web browser, you will sign out from your accounts automatically. Stay signed in option is best for your personal computer where other users have no access to your user account. Using that option will keep you signed in everyday until you sign out by yourself. 2. Now click on the down arrow next to your profile picture (Email address in some cases) at the top right corner. 3. Click Add account button there. 4. Again you will get the Google sign in box to sign in with another Google account of yours. Just provide Email and Password, and Sign in. Note: If you have more Google accounts to sign in with, repeat the steps 2, 3 and 4 again. 5. Once you finished signing in with your multiple accounts, you can click on the down arrow again next to your profile picture or email address, and switch to the account you need to use. * If you click on Sign out button, it will sign you out from all the Google accounts you have signed in. I have one Google Account for now. But as I launch a product later, I might want to have another. I didn't know I could have multiple ones. But it makes perfect sense! 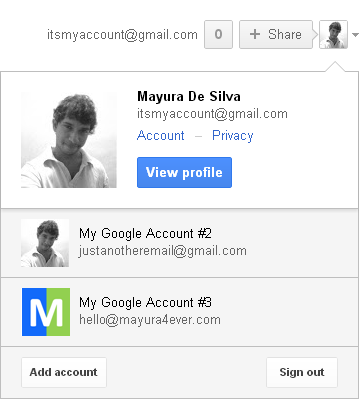 I do have several gmail accounts for different things, but now I can have a Google account too. Oh Boy! This is exciting. Ah...I knew this one too Mayura! Though I have one Google account and prefer to keep it that ways, my husband also has his own account, but we both share each others accounts and that's when we learned about this option! It was fun for a few days and till our work was required. Even now we have our shared accounts, though we use it rarely. I guess if you have many accounts, you need this sharing feature so that you really don't have to log in and log out of all your accounts to check your inbox and other things. It surely is a very helpful feature. You knew it? ;) Seems I'm late then :D lol... Glad you knew about using multiple accounts 'cause I know not everyone knows about it. So... You are a techy, huh? yep...hv been doing this since i started off with DMC...having multiple google accounts is a norm these days, and i always wish to segregate and have related mails in related google accounts. So when i opened up my techivy site, i created its own google account to keep track. 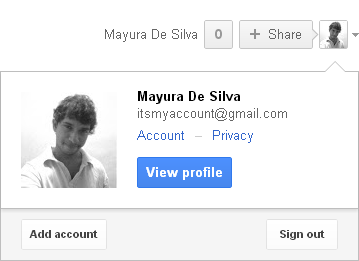 Hello Mayura, I have been using G-mail for years and I only have one account I never seen a reason to create a second. I love G-mail and how clean the interface is and they're still improving it each and every day. Hey Mayura! Great post! I have 3 gmail accounts and have been using the multi signin for quite some time now. I really enjoy it. Thanks for sharing it! Wow, thank you so much for this Mayura. I have created several Google accounts until I realized that's it was driving me crazy as one is linked to YouTube and another to something else and so on. Not fun at all. I will definitely use your tutorial to join all my accounts, so to speak. Amazing X 100. I was in dire need of this one, I always keep on thinking possibly if google can provide the same. But again as a technical person, I use to think...session variables and all techy stuff and finally use to think it is not possible. But amazingly you provided one of the greatest tip. Thanks for this awesome share. I have one Google account other one is for my blog set up with custom domain :) I agree there and not everyone needs 2 or more Google accounts unless they exceed their storage or usage limits. Two for you and one for Titan? ;) You are always catch up with new online changes and glad you have been using this feature with your Google accounts dear. That's a time saver and when it's available for us why don't we use, right? :) Nice to hear you are really enjoying it. You're very welcome dear :) Oops... Multiple accounts help us get some headache, no? Now you don't wanna play sign-in/out game no more. I hope you will really enjoy this option and save more time for you Sylviane. As I implied in the post, if you sign out, then all your logged in accounts will be signed out automatically dear :) So you need to sign in with what you need to and remember to sign in first with most important account of yours. As I believe the sign out option is more helpful for ones who are logging in to Google accounts from another computer as they don't wanna sign out of all one by one. Yeah, upto 10 accounts dear ;) Seems there are folks obsessed with Google accounts and never heard someone use more than 5 though. Great information Mayura. I only have one google account and I am glad to learn that I can have multiple and it is easy to switch from one account to the other without signing in and out. This is pretty amazing and it reminded me of facebook as you can use the same kind of arrow to switch personas. Great information shared Mayura. Keep it up! Hi Mayura, I use this all the time. I have a personal Google account and a Google account for The Wonder of Tech. This new feature helps me switch back and forth a lot. The only time I run into trouble is when my daughter signs in on my computer with her Google account. That's not supposed to happen, but I'm here to tell you that it does! This is valuable information that will save people lots of steps, Mayura. Thanks for sharing this! Well, on Facebook actually it's about switching between page and profile which is true for Google+ too dear. Here it's more like having two Facebook accounts and switching back and forth. Got it, right? I'd be surprised if you didn't know :D lol... Ah there you go... One for personal needs and for your blog. It's saving some time for us, right? Oops... If she uses "Add account" button instead, it won't be a problem though dear. Isn't she? Or she's signing out yours before she sign in? Oops... I used to do it before I knew about this feature too mate. It was something I didn't like and I love this option. I hope you will really love it as you have 3 accounts and no need to sign in and out all the time. Absolutely it will save some time each day and time is valuable enough, no? :) That will give you more time to focus on your primary goals and that's for more fruitful 2013. Works like a charm and using this option I can now check mail on my primary account AND keep track of things going on in that project using my 'private' account as the single sign in... Pretty nifty! I have been using the Google multiple accounts for a while now to keep my businesses and personal email separated. It just makes life easier for me. I love this option of adding another account because it makes switching back and forth so easy because when you add the additional accounts it simply opens another tab for you so you can be working on your computer and still monitor multiple email accounts. It's great! I guess the only thing I don't like, is when you sign out of one account it signs you out of all of them. This is kind of annoying, don't you think? Thanks for another awesome post! I love the tips and tutorial you gave and I'm sure they are very helpful to your readers who aren't already taking advantage of this really cool option. Have a good one, Mayura! Owkies... So you know :) Absolutely I find it easier for me too and hope all others as well. When it comes to sign out, personally I don't sign out much dear. I've signed in to all my accounts and that's it. Everyday I just need to go to my account and check for what's new. But let's think about a public place, so the sign out gonna be very helpful as they don't wanna sign out from each and every account, no? :) However I hope Google will add "Sign out" and "Sign out from all" options in future. Thanks for coming by and sharing your thoughts and experiences on multiple sign in feature Jess :) I really appreciate your wonderful compliments there and you know, the support I've get from everywhere is keep me encouraging and I love it very much :) I know same goes for you as a blogger. I only have one Google account and don't use Gmail but it sounds a real time saver for those who do. Ohw yeah mate :) Cool indeed and helpful for folks with multiple accounts. So you are satisfied with one Google account so far. Well, if you ever wanted to have another, now you know you can switch forth and back without keep logging in and out. I had heard about that some time back Mayura but didn't take action at that very moment. I'm glad I stopped back by your place today to read this post and I immediately added my other main Google gmail accounts that I check on a regular basis. Thank you for making this so clear. You're my go to guy! You're very welcome Chathu :) Glad to help you out with your doubt there.